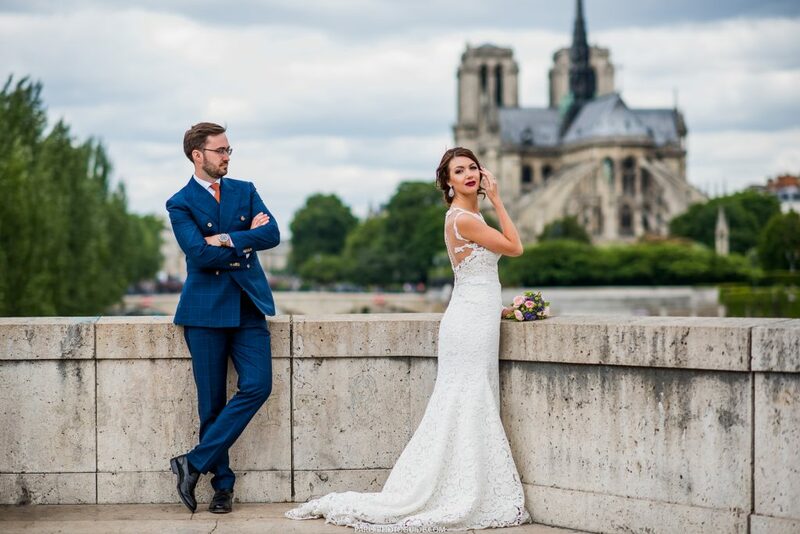 Your Paris photographer prepared some tips, which will help us get the best out of our photo session in Paris. Now is the time to scramble through your wardrobe! If you are considering a couple photo session for instance, try to find an outfit that matches that of your partner. Both in style and color. The more homogenous the clothes are, the more natural the photo session will appear. 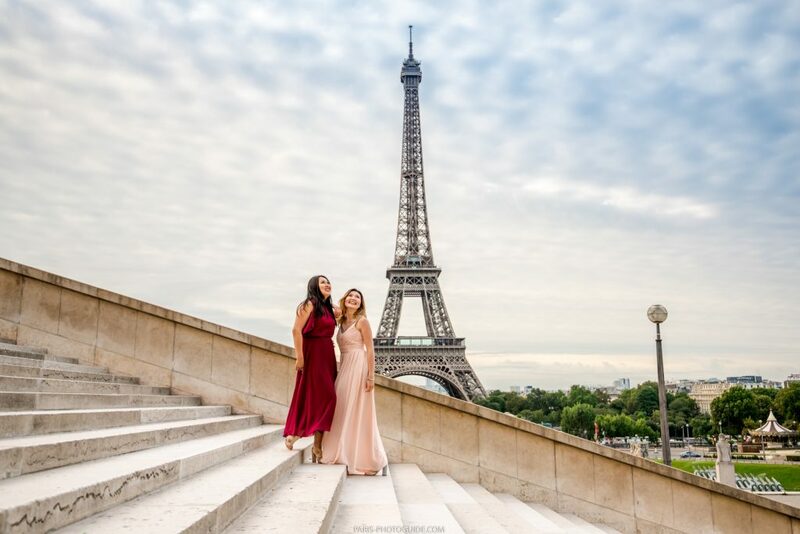 For girls, one of the best choice for meeting the Paris photographer is a bright colourful dress: beardoux, deep blue or even a classy black dress will fit perfectly. Just be sure that it flutters your advantages and hides what needs to be hidden. (Attention! Red dress doesn’t match all types of girls. If you have pale sensitive white skin (especially with black hair), red dress is not for you. Also red dress requires good hair dress and make up, otherwise you will be “lost” in it and it will look strange). Always prefer high heels if you can (unless your partner in the same height with you), to top off the charm. Of course, it’s not only about what you dress. Much of the magic is about the small extra touches: make up, light hair style (keep in mind that it might be a bit windy in Paris), clean shoes and so on. Consider wearing multiple layers of clothes, especially on cold days. It can be chilly in Paris in winter, but more importantly, it is a great and easy way to quickly change style and unveil a new outfit. Changing clothes creates dynamics in a photo session that brings it to another level altogether. Be a star at your own photo session! In the end, it’s all about you and how confident you are in front of the camera. And when you feel comfortable and confident — girls, even if it requires to buy an extra pair of Louboutins! 😉 — you will have have stunning photos. Usually, our most popular package with the Paris photographer is a 2 hours photo session. It is the perfect package for visiting 2 iconic places in Paris. Unsurprisingly, Trocadero place offers the best view of the Eiffel tower. Do not hesitate to bring your most gorgeous cocktail dress – this is the perfect location for it! Same for Louvre and Pont Alexandre 3. All very classy places with historical monuments and buildings. 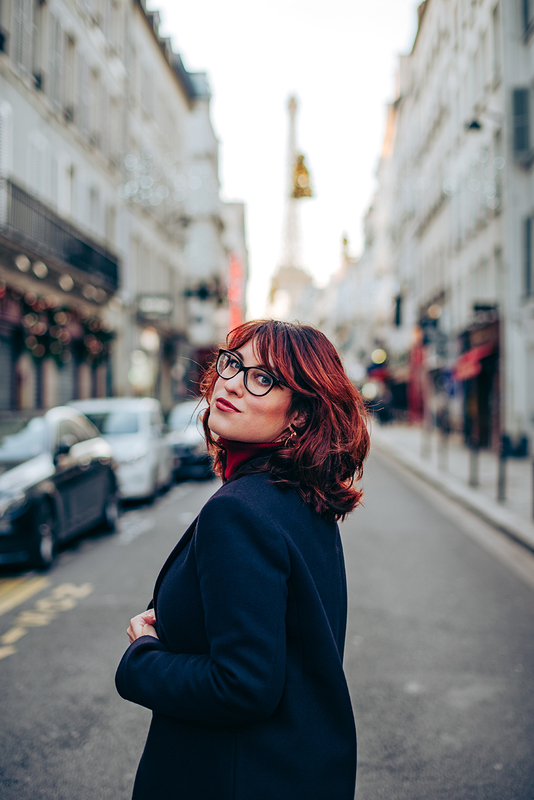 If you are considering authentic parisian streets such as Cité, Montmartre, Quartier Latin, or Jardin du Luxembourg, I would recommend a more casual outfit. It better blends in the parisial lifestyle making authentic pictures. If you are planning on changing outfits, (twice on a 2 hours package is ideal), let me know in advance. We can find restaurants and public rest rooms if you wish to do it peacefully. Keep in mind however, that some locations do not provide such shelters. Do not worry though, I know some hidden places where we can sneak in for a fast change. Cafés near popular locations on some secret secluded areas. Of course, the best timing to start your photo session is in early morning, sometimes even before sunset. This helps us capture the perfect light conditions to render soft and sharp pictures. Moreover, lack of tourists around these early hours will let us be creative in our framing and posing. Paris is a busy city after all!. To add some extra interest to your pictures, feel free to bring props with you! Some regular classics are flowers, champagne, umbrellas, balloons, etc.. 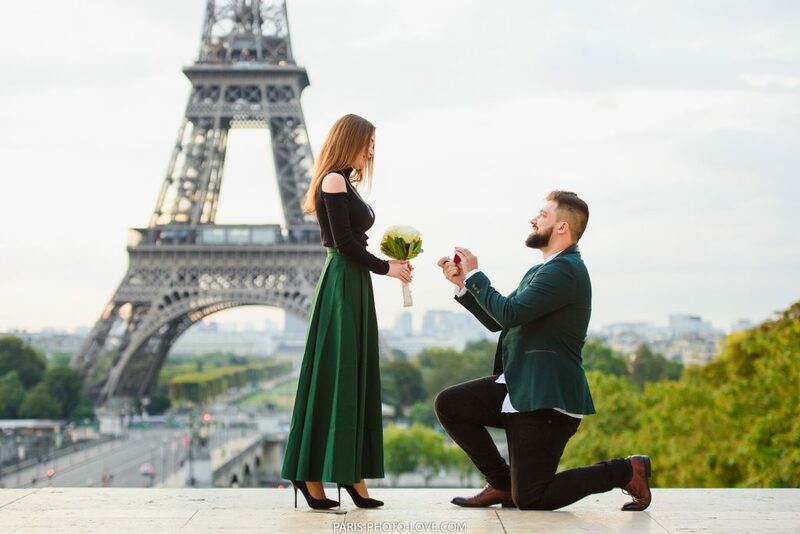 Though, props should not distract you from the main purpose of the couple photo session – getting connected with your second half (if it’s a couple photo session) and showing real feeling and emotions. Weather in Paris is unpredictable. Even if the forecast insists that will rain, we cannot be a 100 % sure until that same morning. But even if so it happens that morning, the rain is all over the place, do not despair. Take umbrellas and go have fun. 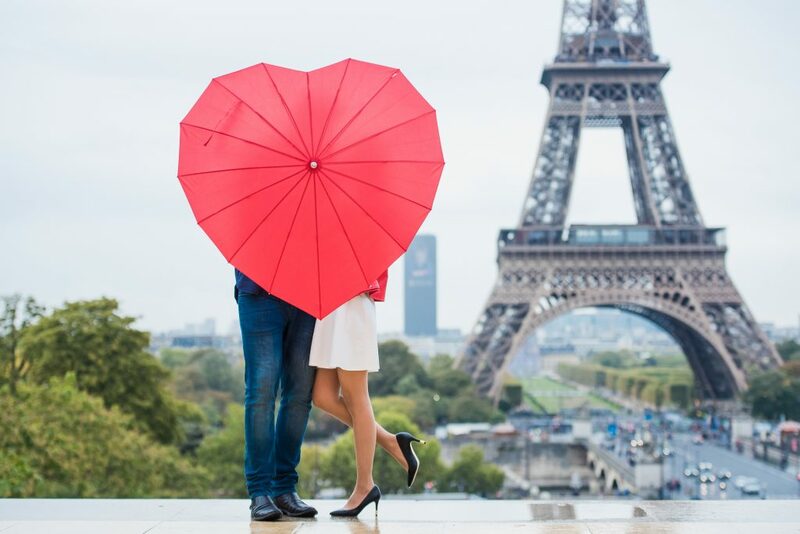 There is nothing more romantic than a couple kissing under the rain in Paris. It is well worth the occasional drop. Worst comes to it, we can always take a small pause and wait for hard rain to stop. It never lasts long anyway. There is a possibility to shift a photo session due to very bad weather conditions. Of course it depends on the photographer’s schedule and it requires a bit of flexibility which can be an issue during the High Season time. So i can not give you 100% guaranty of changing date\time in case of an undesired weather forecast. For minimal distraction please, leave all your valuable things in the hotel. Try to be light and easy to move from one location to another, without being worried about the safety of your possessions. I am quite serious about this. Paris is known for petty theft, so just leave your valuable belongings and passports at the hotel. Don’t let anything spoil your mood and good memories.